EABASSOC BSP is a high quality, polymeric, water based chemical converter and primer for rusted surfaces, which can cope with conditions where ordinary anti-corrosion primers will not function. It chemically converts damp and rusty surfaces, making them suitable for the application of high performance coatings without the need for special, expensive surface preparation. Requires only simple surface preparation and so is suitable for surfaces which cannot be grit blasted down to bright metal for practical reasons. Extends the life of protective top coatings by ensuring excellent adhesion with both the substrate and the coating, thereby significantly reducing maintenance costs. Water based and can be applied on damp surfaces and in humid environments. Non-flammable, environmentally friendly and safe to use. EABASSOC BSP Chemical Converter / Primer is a high performance, ready to use polymeric primer, which can cope with conditions where ordinary anti-corrosion primers will not function. It is, however, more than a physical primer. Its multi-stage chemical action stabilises bad surfaces and converts them into surfaces suitable for the adhesion of high performance protective coatings. 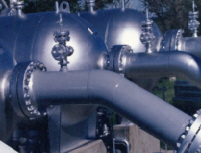 EABASSOC BSP has been developed for use in damp, rusty, challenging environments where it is difficult to conduct special surface preparation and where most products could not be applied. It has a proven record in the marine and oil industries. It is widely used on oil platforms, pylons and railings, pipelines and tanks, ships, bridges, factory plant and equipment and for vehicle maintenance. As it is water-based, it is non-hazardous and non-flammable making it safe and easy to use, particularly in areas where safety is important. EABASSOC BSP is not however suitable for use in low temperatures. Instead, EABASSOC BSP Liquid is available which is a very similar product, but is not polymeric and, therefore, suitable for use in low temperatures.